Avoid late fees and having to remember to pay tuition, enroll in automatic debits below! ​1. First month of tuition is due June 15th, 2018 for the 2018 - 2019 dance year. All automatic (ACH) payments will be withdrawn the first business day of the month. 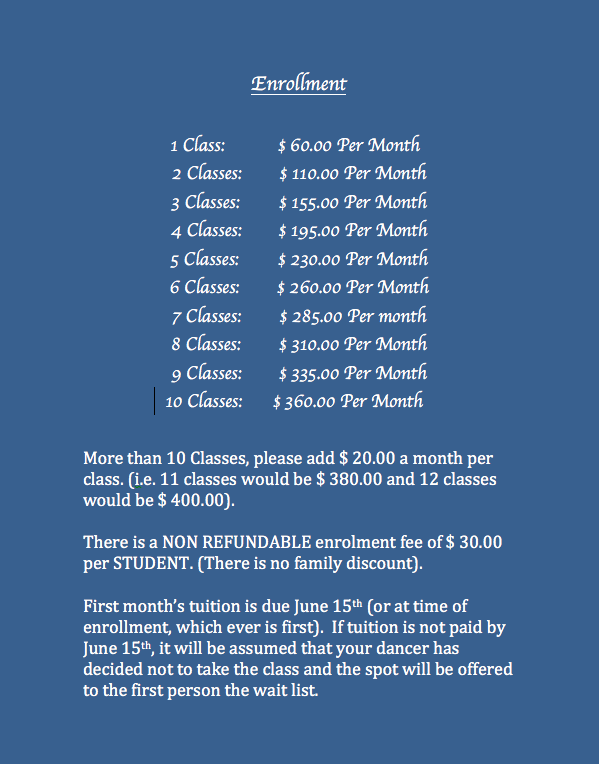 2.. All tuition is due a month in advance beginning September for October's classes. Late fees are assessed if payment is 10 days late. ​3. We must have 2 weeks notice for any dropped classes in writing (mailed or emailed). Without that notice in writing, we are not able to refund any monies paid and you will continue to be charged tuition and late fees. 4. All recital and costume fees are non refundable.